ISDN Voice Recording Studio, Cheltenham, South West, Sylmerrillion Voices. 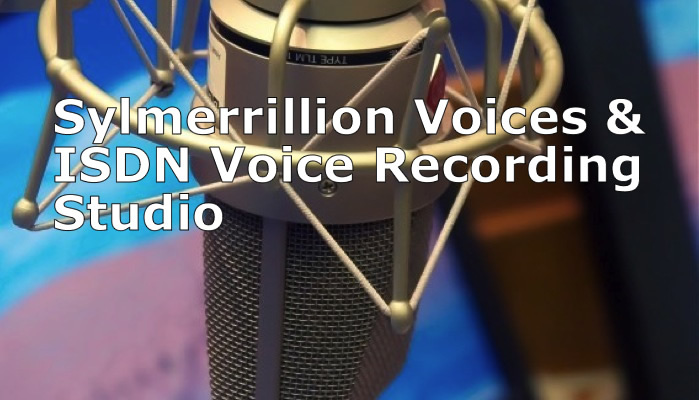 Sylmerrillion is a professional ISDN digital voiceover recording studio in Cheltenham, Gloucestershire. If you need a voice over for your radio or TV commercial, web page, pod cast or corporate presentation then we can help you. We have a selection of professional voice overs to choose from and with over 25 years experience in the voice over industry we can also give advice and guidance with your project. Our ISDN studio means that we can record voice overs from all over the world and of course if you need to be recorded in another location we are able to link up with other ISDN studios, both in the UK and World wide. If you are interested in becoming a voice over artist, you can plan and record your Voice Show Reel at Sylmerrillion Voices. You will be working alongside an established voice actor who can guide you and coach your voice. If you already have a voice reel and would like to amend or update it, we can certainly help there too. Demo recordings are charged at a fixed fee for a 4 hour session, so you don't have to feel rushed and can work at your own pace in our relaxed surroundings. Andy Turvey © 1998- 2018 Copyright Protected website designed by Website Design Cheltenham online marketing- Search Clinic and- Business Win SEO Services- SEO Services Cheltenham.